[Image: The Château de Breteuil in the Île de France]. For a variety of reasons, I've been thinking about a business trip to Paris that my wife and I took back in July 2006. At one point we visited a château in the Île de France, northwest of the city, arriving by bus in the early afternoon for a private home tour with the palace's long-time family owners. It was the Château de Breteuil. 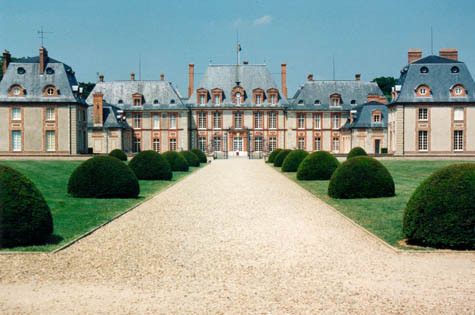 The de Breteuil family history included one Louis de Breteuil, a minister for Louis XIV, the Sun King, and, according to the château's own website, "a contemporary of Charles Perrault." Perrault, who otherwise had no biological or genetic connection to the family, as far as I can tell, was the author of several now famous children's stories, fairy tales featuring characters from Puss in Boots and Tom Thumb to Little Red Riding Hood. However, my wife and I were both stunned and slightly amused to discover that those fictional creations have now "taken up residence in the Château de Breteuil," as the website explains. "They enliven the stables, the fruit storeroom, the washhouse and all the other places which still illustrate the daily life of times gone by." What this means on a practical level is that the building is full of facially realistic wax statues and animatronic stand-ins, representational surrogates that now and forever act out scenes both from Perrault's fictional tales and from the de Breteuil's own family history. 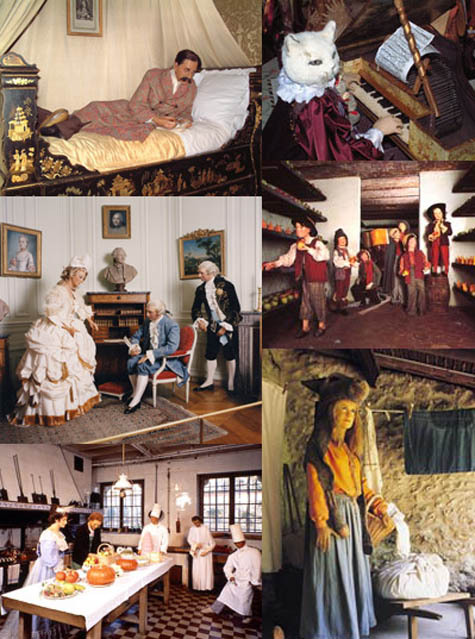 [Image: The wax stand-ins of Château de Breteuil; in the upper left corner is Marcel Proust]. As the de Breteuils themselves explain, you will "learn a lot of things about the life of our ancestors" through your encounter with these family doubles – and, perhaps best of all, "you will see a bathroom such as you have never seen before." I want to add very quickly that our hosts were both personable and gracious, and this perhaps explains why I didn't post about the experience at the time; but it has also grown no less surreal with age. It also seems possible now to highlight the utter strangeness of this place, and its very particular mnemonic agenda, without belittling the residents. But it was very strange. [Image: Puss in Boots stands before the Château de Breteuil]. For instance, in a detail that would sound made up under any other circumstances, Henri de Breteuil, a late 19th-century scion of the blood line, personally "provided the inspiration for French writer Marcel Proust’s character Hannibal Breaute who bears the same initials 'HB'." There is thus a wax statue of Marcel Proust – that arch-memorist whose entire literary career was an act of recollection, bringing radiant history back to the murky surface of the present – reclining on a day bed, preserved in one of the home's many sunlit chambers. If you go back two images in this post, Proust is the mustachioed man in the upper left corner. He lies there everyday, representing himself. There are so many layers of memory, inheritance, and psychoanalytic attachment going on here that it seems almost impossible to articulate. What would Jonah Lehrer make of such a place, I wonder – or, for that matter, Sigmund Freud? This strange hybridizing of family history with characters from classical fairy tales seems like a deliberate "use of enchantment," as Bruno Bettelheim might say – mythologizing one's own genetic lineage even as it makes explicit the narrative and psychoanalytic power of those increasingly distant ancestors. You live in a mansion full of animated statuary – where those statues are the people who created you. In some ways, though, I also had the distinct feeling that I had stepped into a variant screenplay for Blade Runner, as directed by Stanley Kubrick: Blade Runner's wounded maker of surrogates incorrectly edited into the penultimate scene from 2001, in which astronaut Dave Bowman awakens to a bedroom full of Louis XVI furnishings, with all of his friends and family transformed into mythic wax figures and talking machines. Of course, this is also a gimmick to get paying customers to visit this Chateau over another in an area that has many. Times are tough for the nobility in France these days! Is anybody else reminded of an episode of the anime Ghost in the Shell: Stand Alone Complex? If I recall correctly, in the episode two characters visit a virtual reality construct that looks a lot like this, and is shall we say puppet- or animatronically themed. I can't find any references right now, sadly. It may be a gimmick, but the next time you're looking to tour a French Chateau, you will remember Château de Breteuil over others in the region. Forwarded this to my France-based sister... she will get a kick out of this. Most chateaus are boring as hell. But this one... looks different. I especially like the little models of Puss in Boots. Quality.